Mobile and home phone users need World Credits to make calls outside of Canada. Fongo users can call anywhere in the world if they have World Credits. 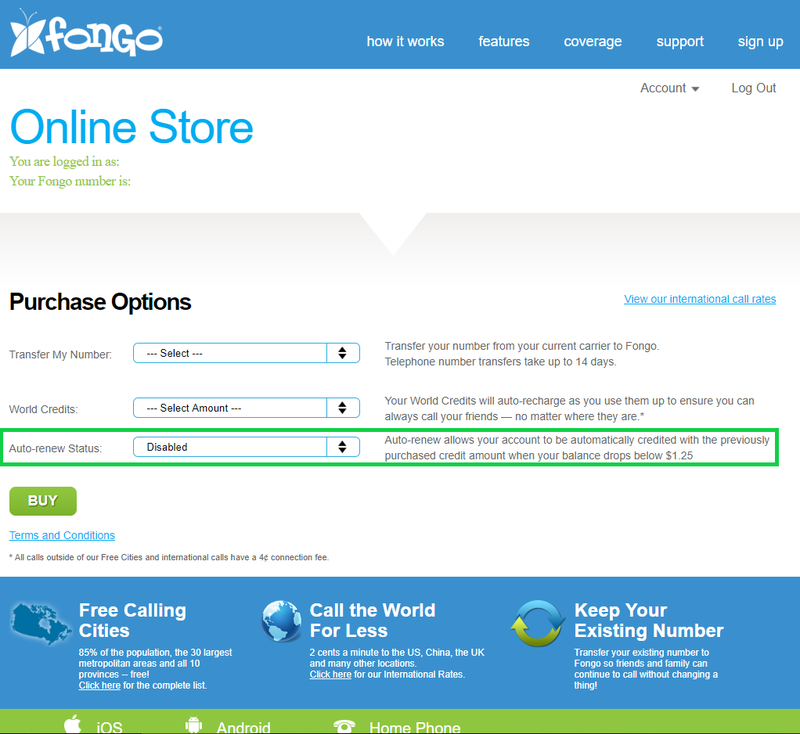 If a Fongo user tries to call somewhere outside of Canada without World Credits, the call will not connect. Click here to see a list of each country’s long distance rates. Each rate is how much will be deducted from your World Credits balance per minute of calling. For example: China’s rate is $0.02/min, so if you buy $5 worth of World Credits and then call China, $0.02 will be deducted from your $5 of World Credits for every minute you are on the phone with someone in China. You will also be charged a $0.04 connection fee at the beginning of each call as soon as the call connects (a person or the voicemail picks up the call). From the side menu, click on Account -> Add-ons -> World Credits. You may purchase World Credit in $5, $20, or $50 amounts. Account Login -> Online Store -> World Credits. You may purchase World Credit in $5, $20, or $50 amounts. Fongo Mobile World Credits will never expire if you use the Fongo app to place an outbound call at least once every Ninety (90) days. Unlike the threshold for auto deletion accounts that have purchased World Credits are not subject to auto deletion. We do consider accounts with World Credits to be dormant if they have not been used in One Hundred Twenty (120) days. To prevent World Credits from expiring on your account, keep the account active by logging into the app and placing a call at least once every Ninety (90) days. If your account becomes dormant, you can reactivate it by logging into the app and placing a call. Fongo Home Phone World Credits never expire. Skip the hassle of manually reloading your account and enable Auto-Renew! This feature allows your account to be automatically credited with the previously purchased amount when your balance drops below $1.25. For example: if you previously purchased $5, the next reload will be $5. If you last purchased $20, then your next reload will be $20. The system checks your balance once every 24 hours, so if you know that you will be using more than $5 worth of World Credits within a 24-hour period, you can log in to your account online and manually add World Credits to your account. Dial 011 if you’re calling a number outside of North America. Visit CountryCode.org for more information. Dial the country code. In some cases, the country code is shared among countries. For example, the United States, Canada, and much of the Caribbean and Guam use the country code “1”. Dial the city/area code (if any) for the number you are dialing. Smaller countries may not use city codes or area codes, while larger countries have hundreds of them. Dial the phone number you are calling.